My first house 19 years ago was in Citrus Heights. If you live in Citrus Heights you know Sunrise Blvd. pretty well. Go east past the mall and you'll come to the complex with the Hometown Buffet in it. Tucked into the corner of the complex is Alonzo's Pizza Depot. Even though I live in downtown Sac these days, I will actually make the trek to Alonzo's for their pizza once in a while. My ex and I still love Alonzo's. Deon even said once (when we had moved to house #2 in Rocklin) that if he won the lottery he would want to have him open a second location nearer our new house. I met up with him last night at the familiar digs. 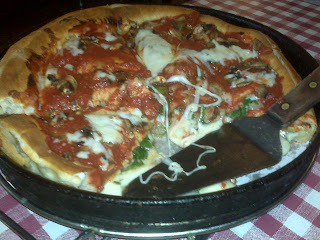 Alonzo's does regular, deep dish, and stuffed pizzas. We always get the stuffed. We have two favorite combos. The Instant Love, pictured, has sausage, mushrooms, and spinach. The Artie's has artichoke hearts and feta and sausage. We also always ask for extra tomato sauce on top. Because the thicker pizzas have a long baking time we normally order in advance. The stuffed can take close to half an hour to bake. We ordered a small and only ate half of it. We each took a quarter pizza home for left overs. The stuffed is that thick and filling. The crust is a yeasty bread crust, nice and chewy. It holds up for the support it provides to the heavy toppings. After all, stuffed slices are about an inch thick. Stuffed has the bottom crust, the cheese, sausage, spinach in the center, another thin layer of crust, and then the sauce and mushrooms on top. Alonzo's doesn't skimp on the ingredients either. Tonite I'll reheat my leftovers on a baking stone in my oven. (I'm not a cold pizza/leftovers person.) It will come out just as great tonite as it did last night. I've become a big fan of Masullo's for thin, Italian style pizza. And Chicago Fire does a good stuffed as well. Theirs are just boring though. In that, they don't have any unusual combos. They just have basic stuff like meaty or veggie combos. So if you are in the vicinity, check out Alonzo's. I'm sure you'll be a fan too.